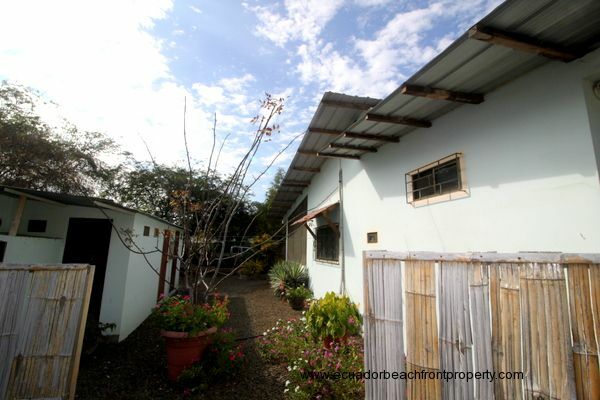 ---- SALE PENDING ---- This 2 Bed / 2 Bath 1300+ sq.ft. 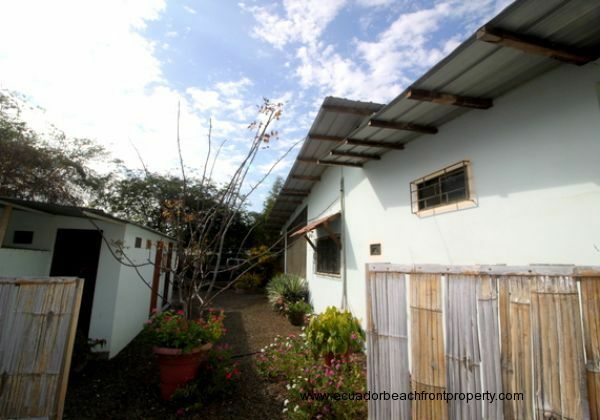 home sits in a tropical garden environment and is less than two blocks off the beach. 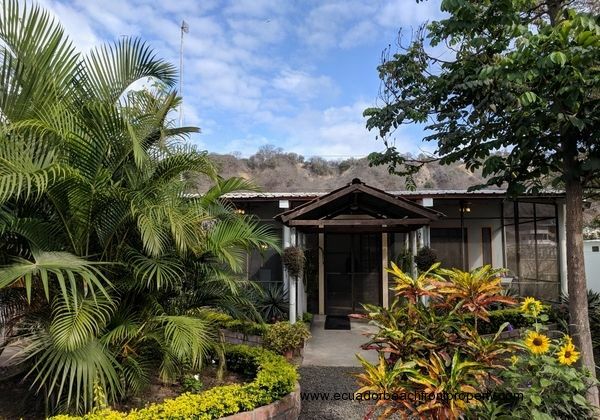 Custom designed and refinished by its current owners, the home provides ample light open spaces and plenty of elbow room both in the house and on the property so you can stretch out and enjoy your space. 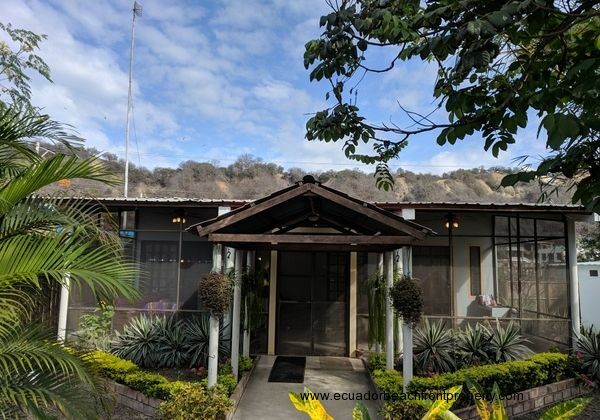 The home is situated in quiet northern San Clemente, not far from the large bluff that rises from the beach on its northern end. 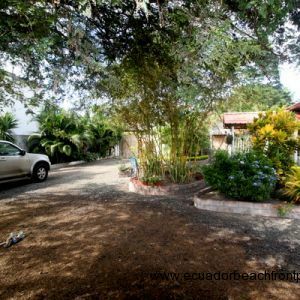 The corner lot itself is just under 600 square meters (6400 square feet) and is located on a beach access road. 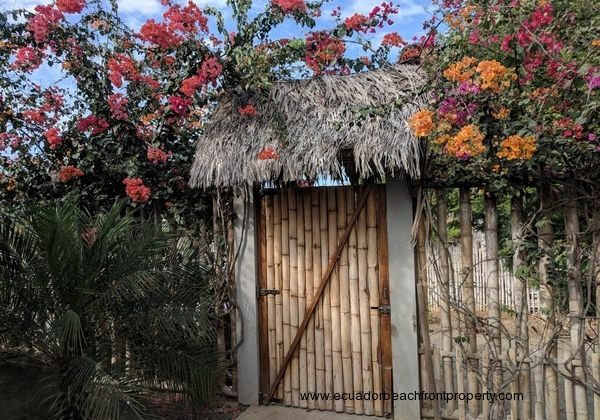 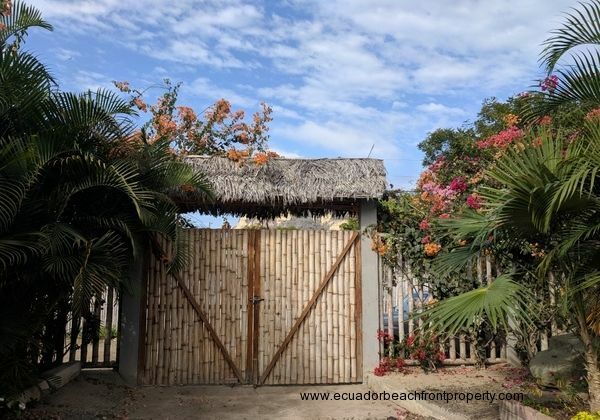 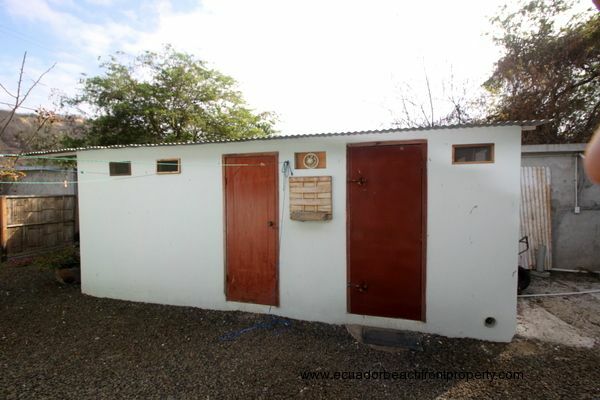 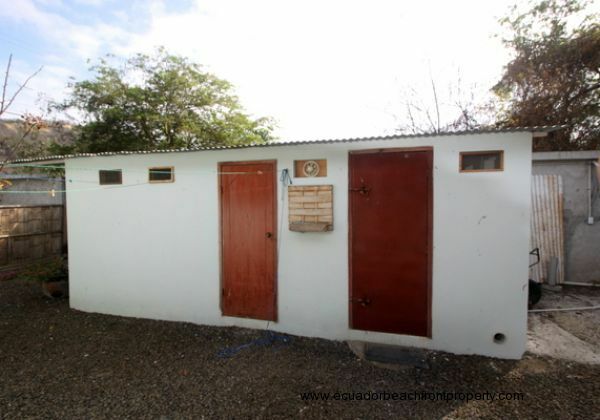 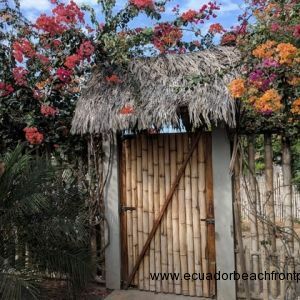 The property is bordered on two sides with tall bamboo fencing that is covered with vibrantly colored bougainvillea flowers and has a solid wall on the other two sides and is secure. 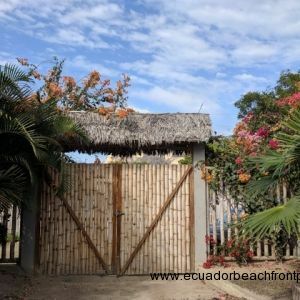 There is a large gate for vehicles as well as a small foot entrance for everyday comings and goings. 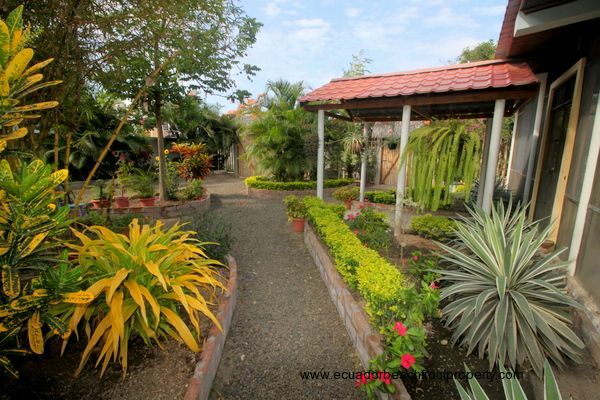 The gardens are lush and abundant with many plantings in raised beds and mature vegetation and palms. 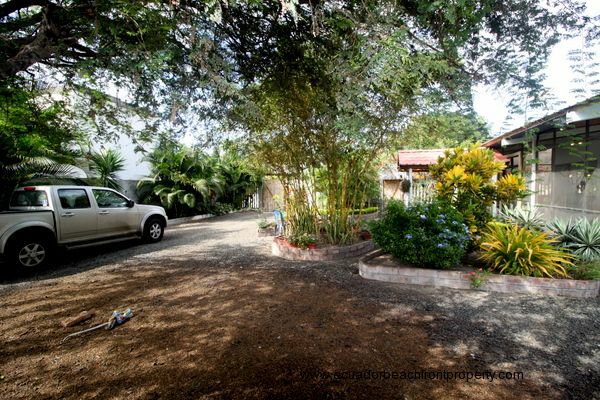 There is plenty of room for parking (3+ vehicles) and outdoor space to tune to your heart's delight. 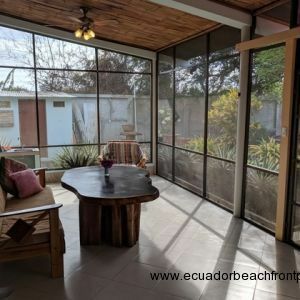 As you walk into the home you enter into a large fully-screened 440 sq.ft garden room with high ceilings and custom 3-panel sliding glass doors. 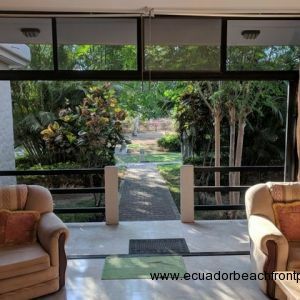 The screened garden room area looks out onto the tropical landscaping and is presently used as an outdoor living room and dining room. 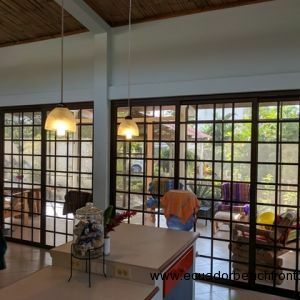 French doors lead into the master bedroom. 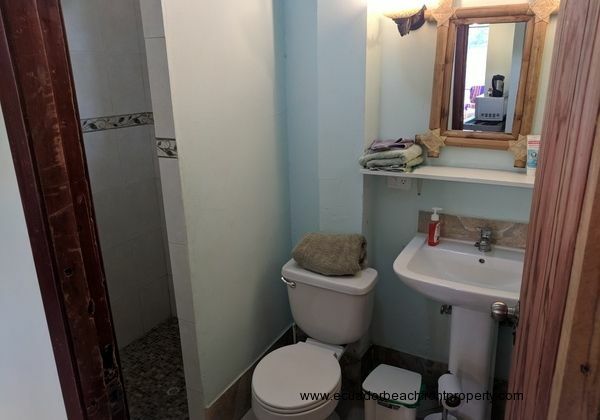 There are 3 ceiling fans in this space as well as a small sink and tiled counter in the corner. 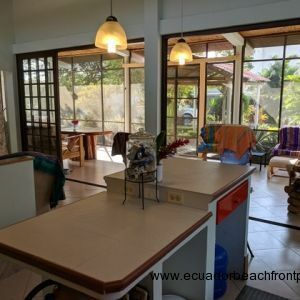 The kitchen is close to the porch and features a two-level tiled island/breakfast bar with electric outlets and excellent lighting. 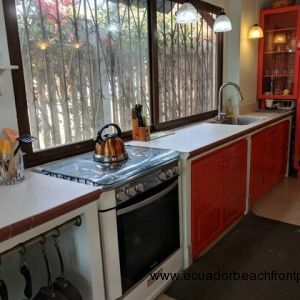 Appliances include a gas stove, oven w/broiler, and a full glass door refrigerator that provides space and visibility for your perishables. 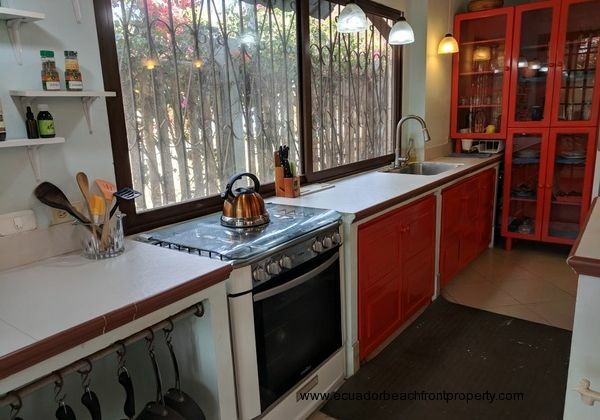 The kitchen sink is large and heavy duty and there are plenty of shelves for spices and a custom China hutch. 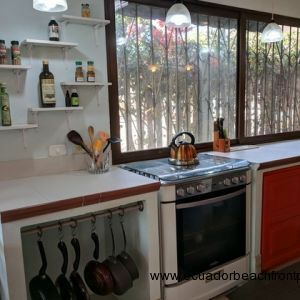 The tiled counter tops provide ample work space again with great lighting. 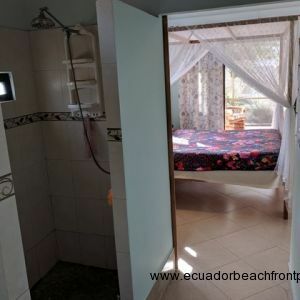 There is a separate coffee and microwave area and huge 8’x4’ window overlooking banks of flowering bougainvillea. 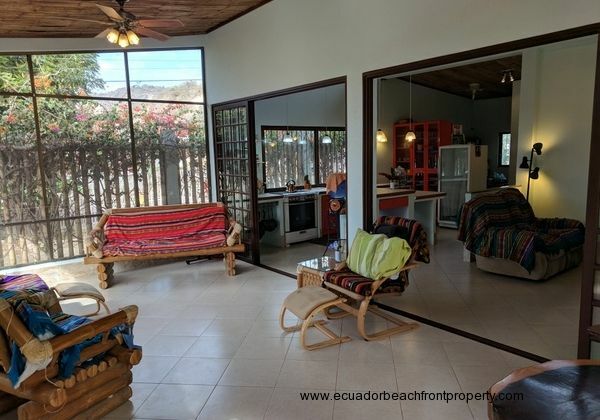 The kitchen/indoor living room has an air conditioner if desired but also breathes nicely on its own as the daily ocean breeze passes right through the property. 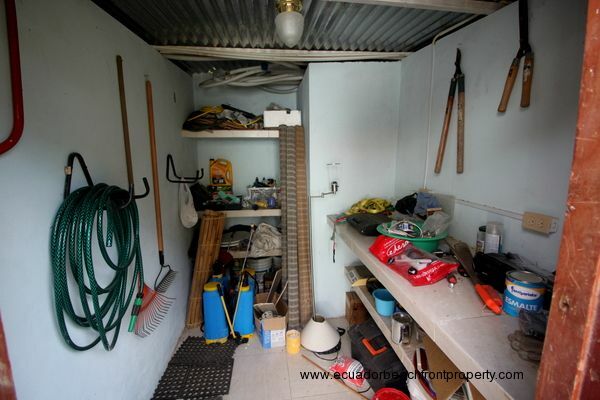 There is a pantry/office space located just behind the kitchen and has a 7 cf chest freezer and a ceiling fan. 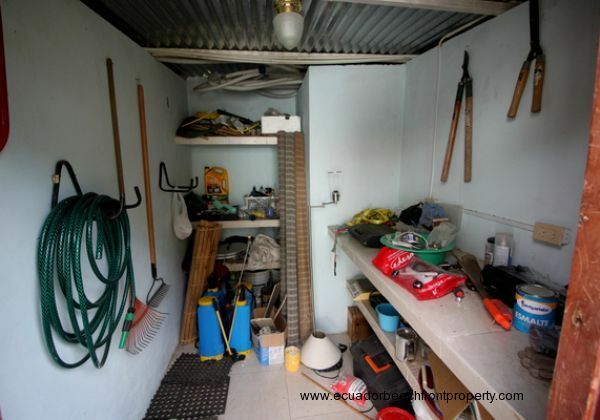 There is plenty of room to customize this space into storage or function living space. 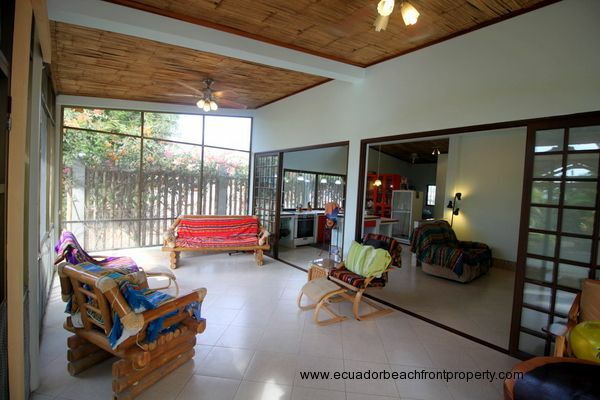 The indoor living room is wired for direct tv and is open to the kitchen as well a, dining, and screened porch. 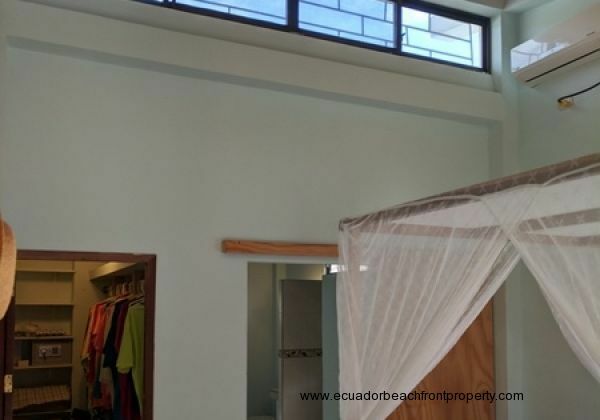 The master bedroom has French doors which lead out onto the screen porch and another sliding panel door that opens to the indoor living room. 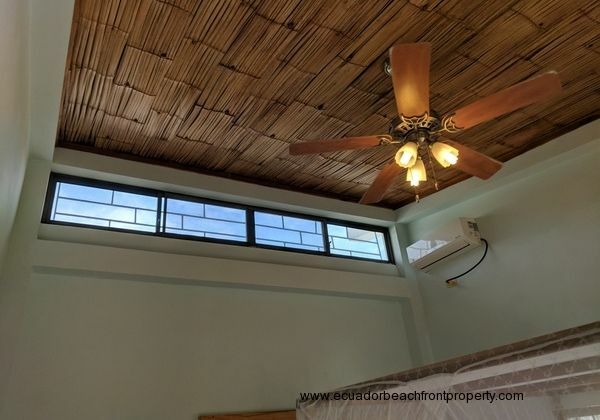 The master has its own AC and ceiling fan. 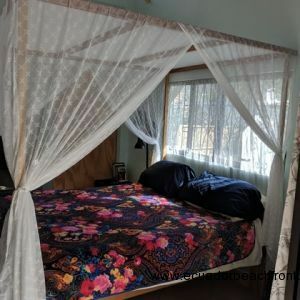 The 4-poster queen size bed fits nicely in the room. A large walk-in closet has a secured safe, floor to ceiling shelves, multilevel bars to hang clothing and its own fan for air circulation. 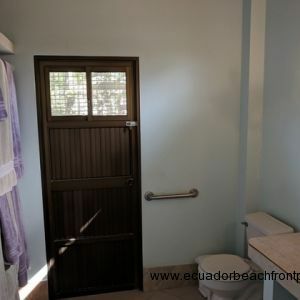 The bathroom has a large, no lip-walk in shower with non slip tile and a secure grab bar, a large tiled vanity with electric outlets and a hand hammered and enameled copper basin sink along with a very large storage niche with shelves. 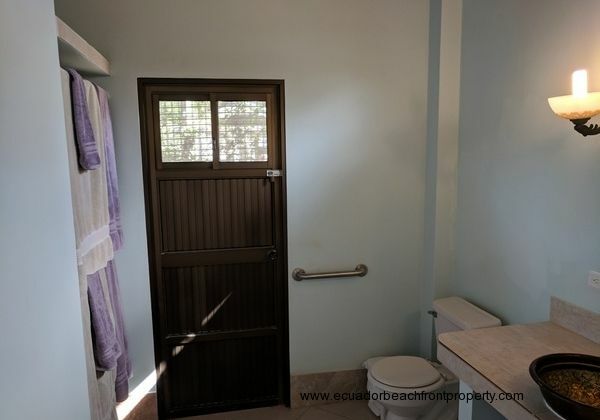 There is a secure grab bar beside the toilet. 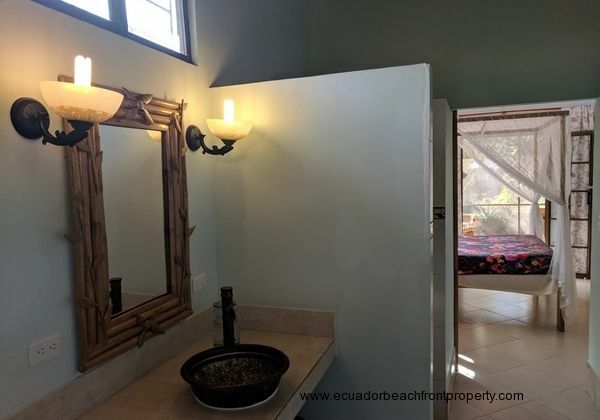 The master bath has its own exit door to the back garden and the outside shower that you can use to rinse sand off when coming from the beach into the house. 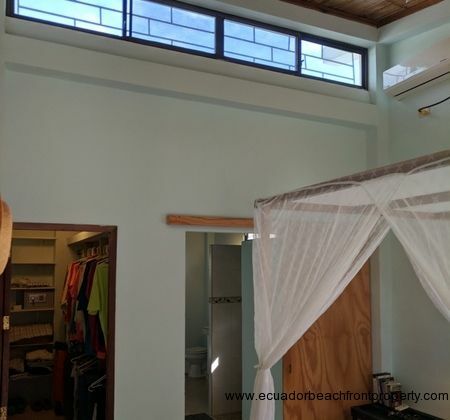 A ceiling fan and two windows keep the air moving. 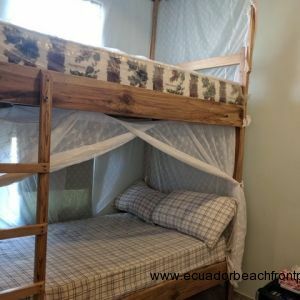 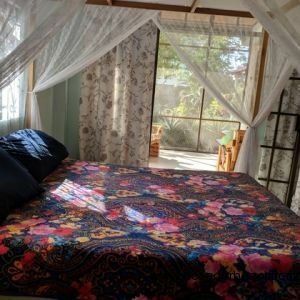 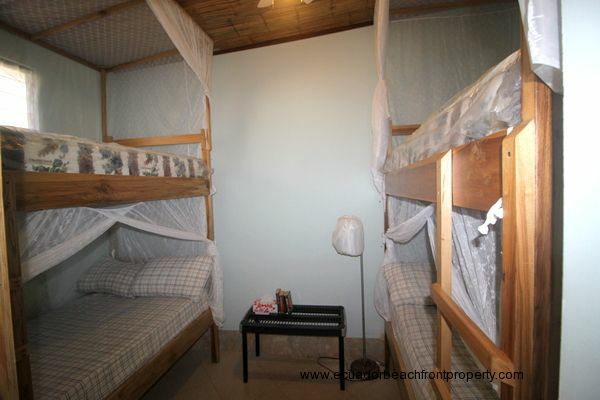 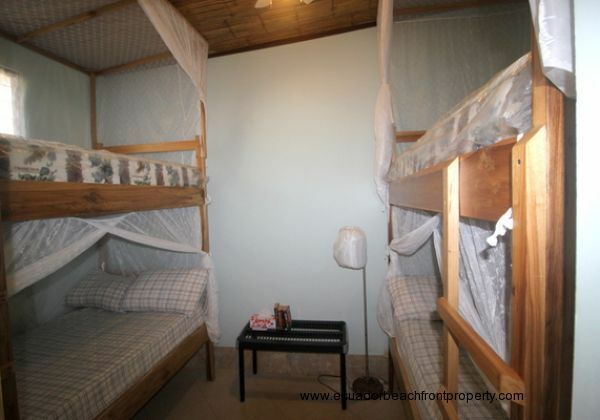 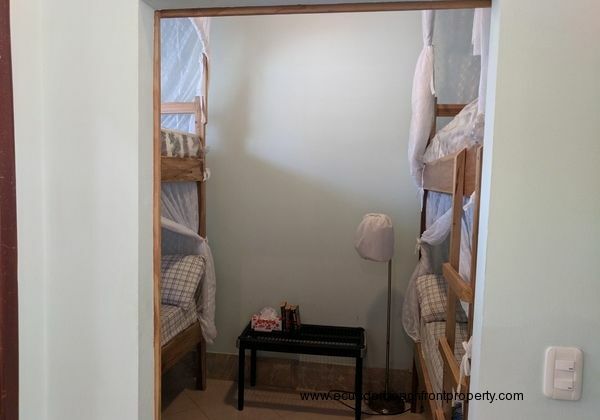 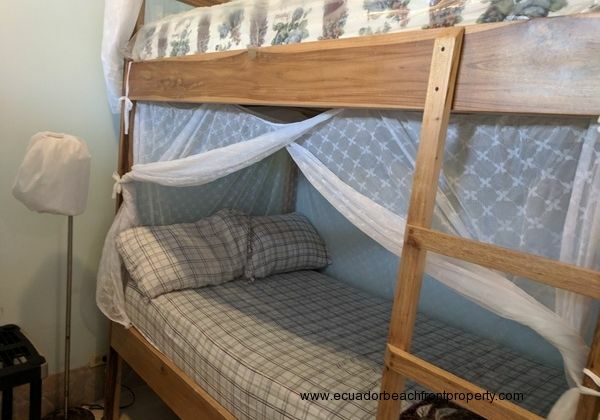 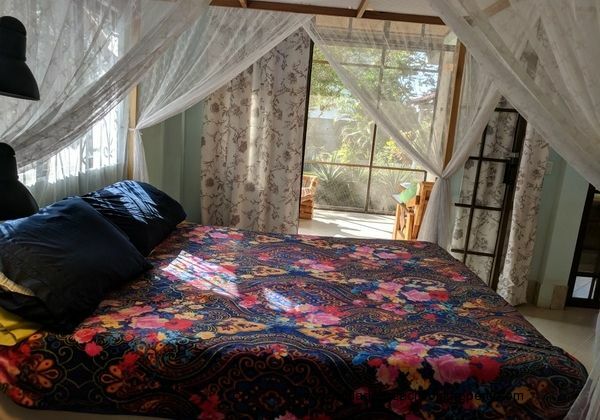 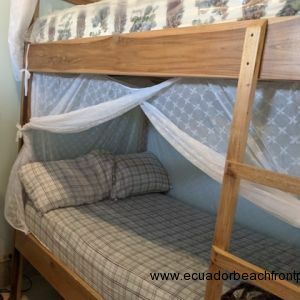 The guest bedroom is very compact and has 2 sets of custom bunk beds sized to sleep 4+ adults with custom mosquito netting. 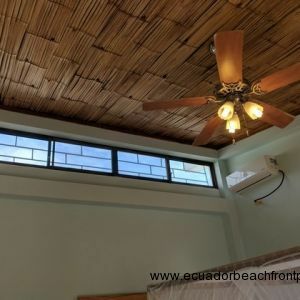 There is a ceiling fan and an air conditioner. 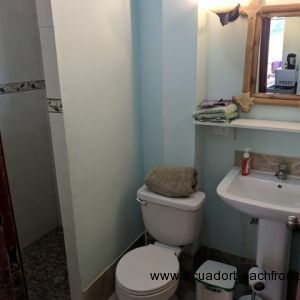 The guest bath is a functional 5’x8’ with a large, no-lip walk-in shower with non slip tile, toilet, and sink with accessories shelf and electric outlets. 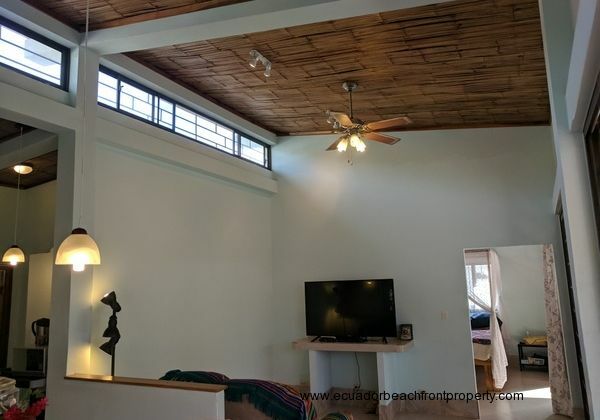 There is a ceiling fan and two windows. 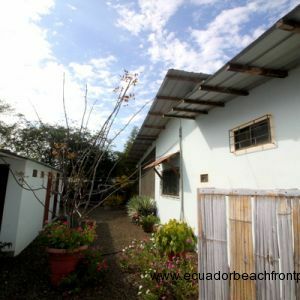 Along the side yard there is a building that houses a small workshop, laundry room, half bath, and an electric room for a private transformer, voltage regulator and an 8000w generator. 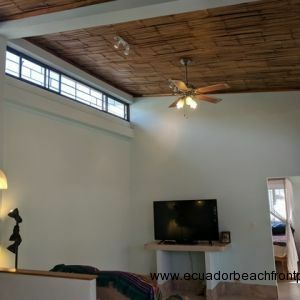 The home has been protected against electric spike and surges and the entire electrical needs of the home can be met by the generator in the case of an extended power outage. 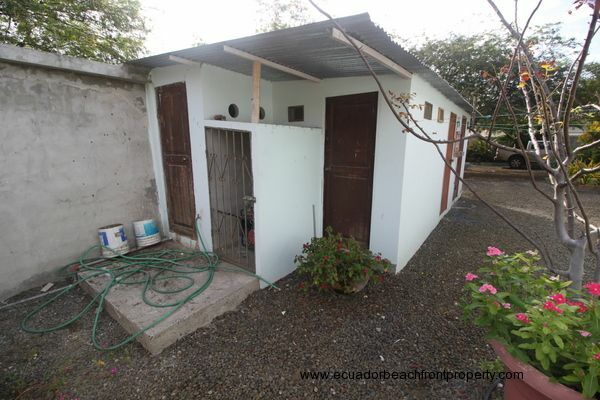 There is also a large 20,000 gallon onsite water storage (cistern) and water pump that provides water pressure in the home. 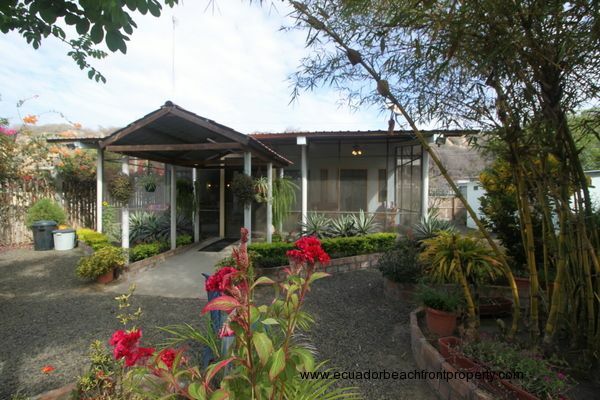 The public areas of the home plus the master bedroom and bathroom are wheelchair/walker accessible and there are no steps in the garden or the house. 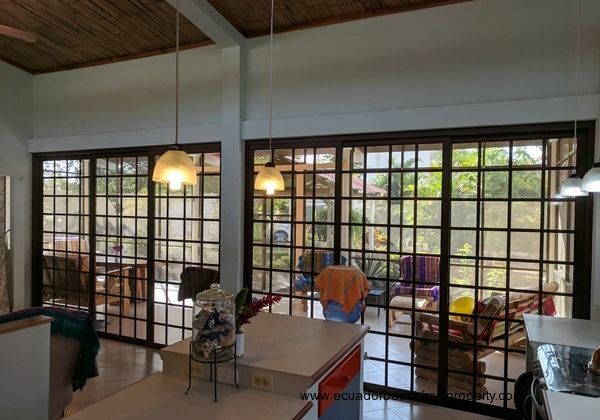 Lots of light and air come through the large windows and beneath the high ceilings allowing all-day enjoyment of the colorful garden. 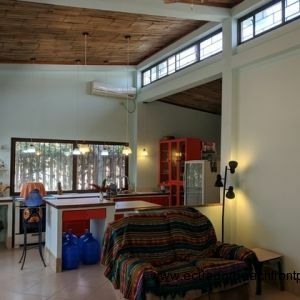 The Clerestory Windows near the roof peak are designed to promote air flow, add more natural light and to assist with naturally cooling the home. 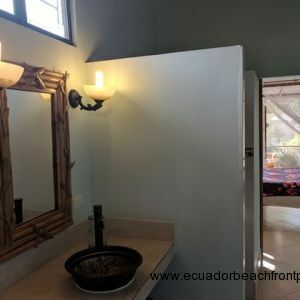 The hand hammered and enameled copper basin sink in the master bath was purchased directly from the Mexican artist 12 years ago. 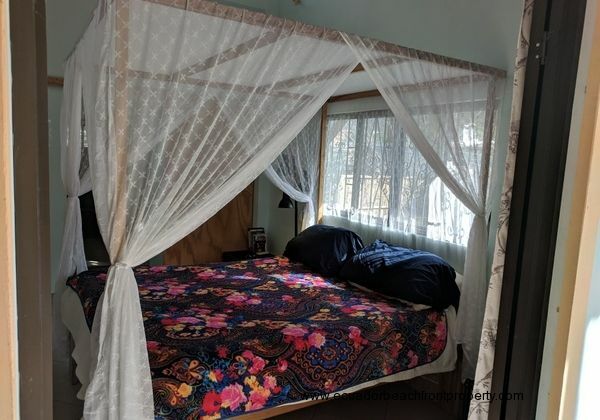 The seller finally found the right home for this piece of practical art. 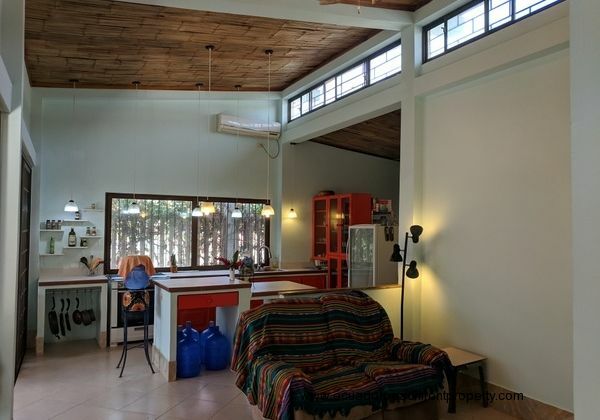 The sellers rebuilt the home from the ground up and reused some interesting parts. 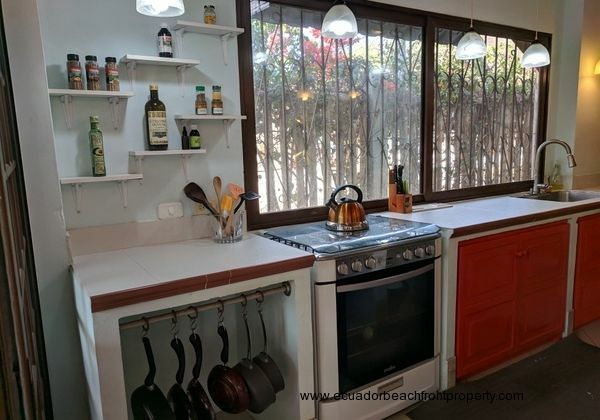 The former window shutters are now the doors on the kitchen cabinets. 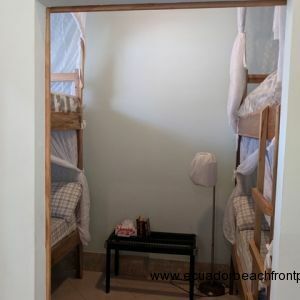 Four of the original and un-refinished room doors have found homes in the new build. 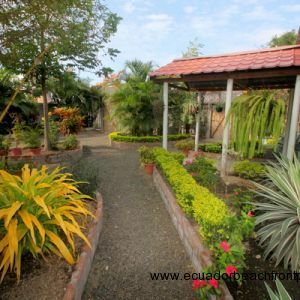 Some of the old concrete roof beams are now edging for the flower beds. 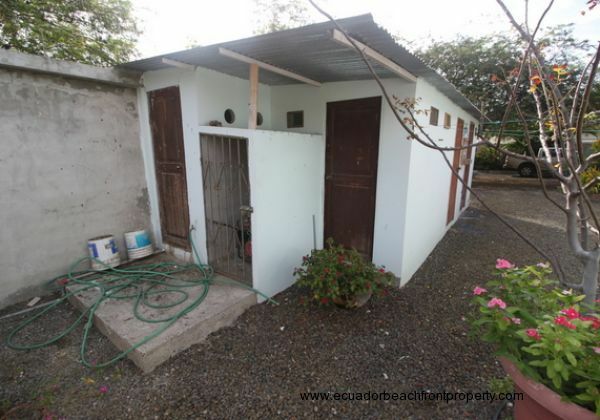 The washing machine is plumbed to put the graywater in the flower bed at the west side of the garden. This home has been customized for enjoyment and is ready for you to come take look. 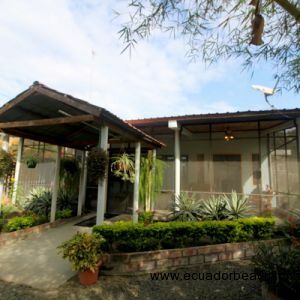 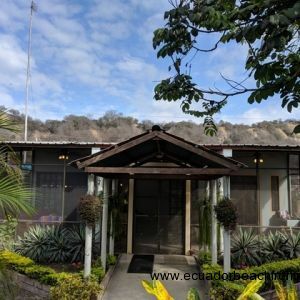 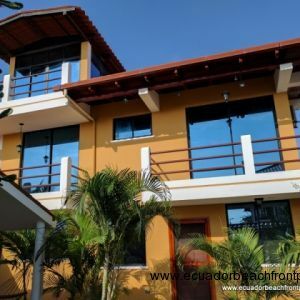 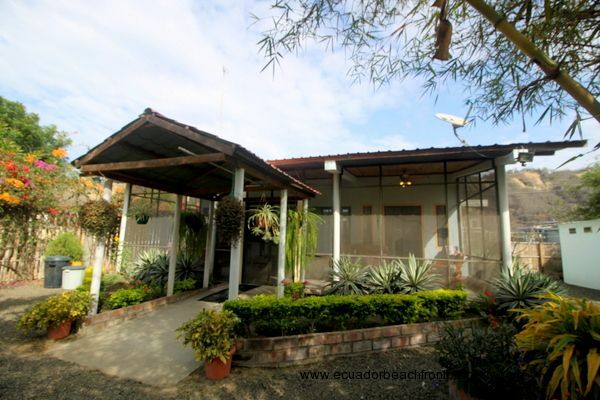 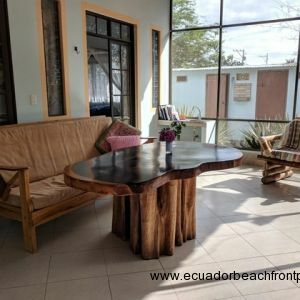 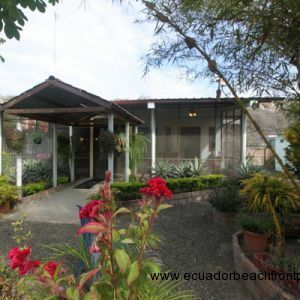 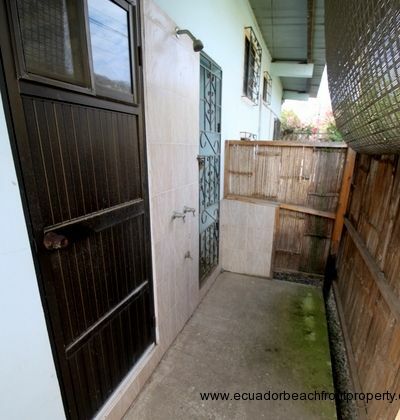 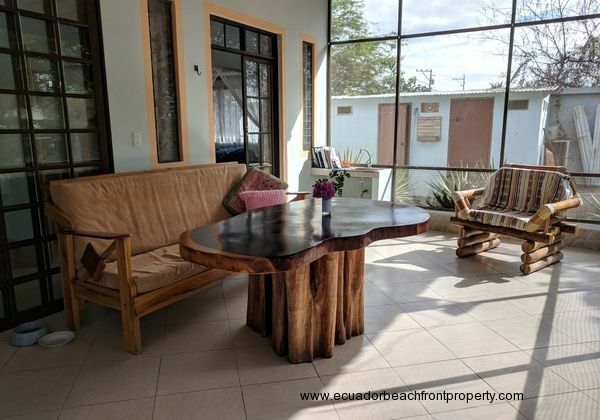 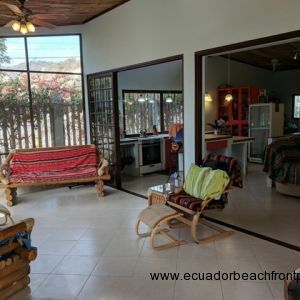 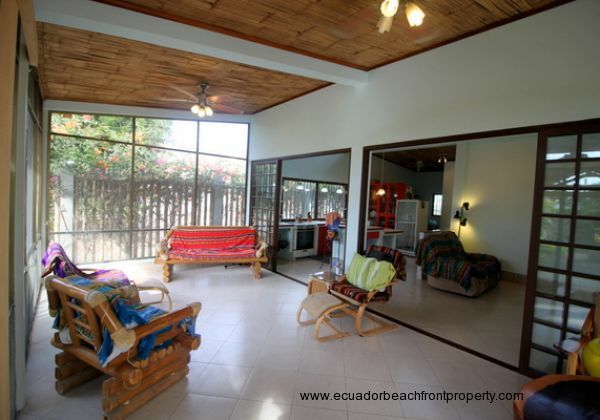 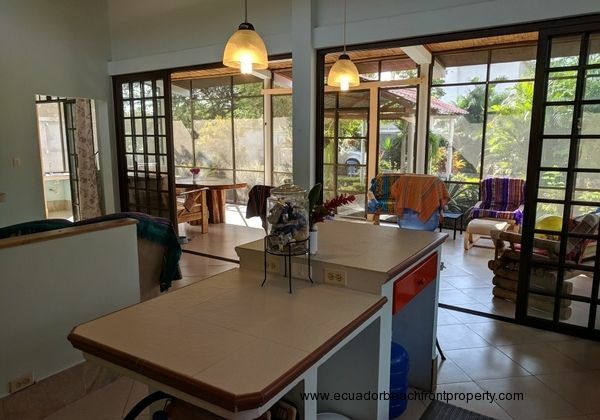 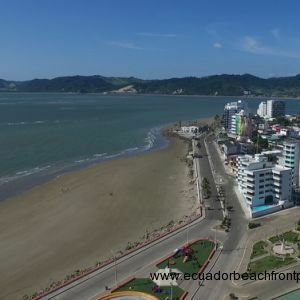 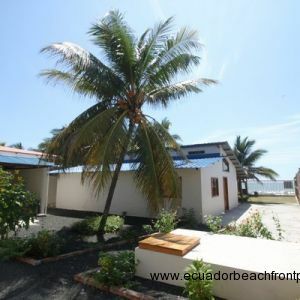 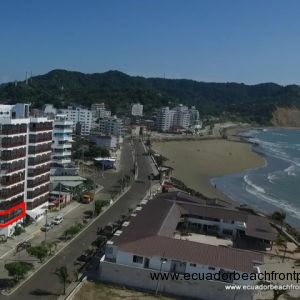 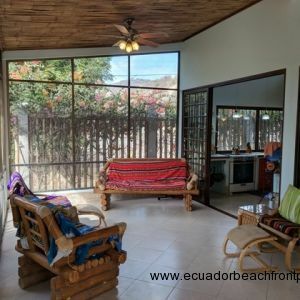 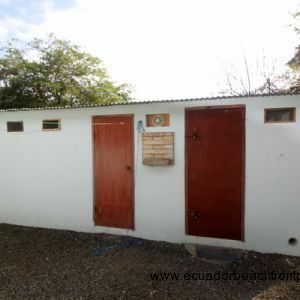 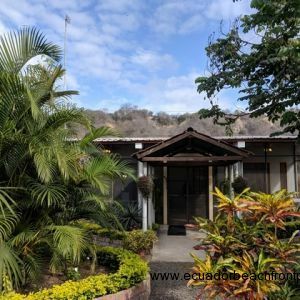 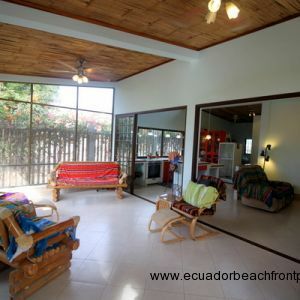 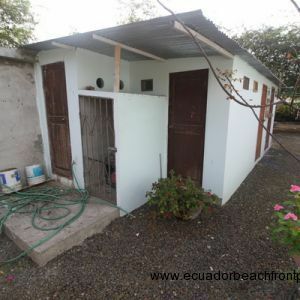 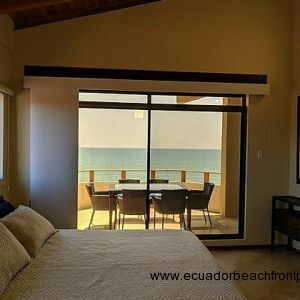 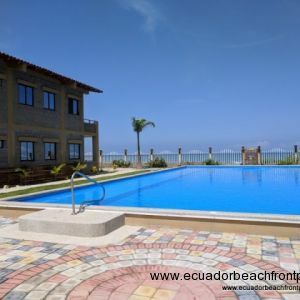 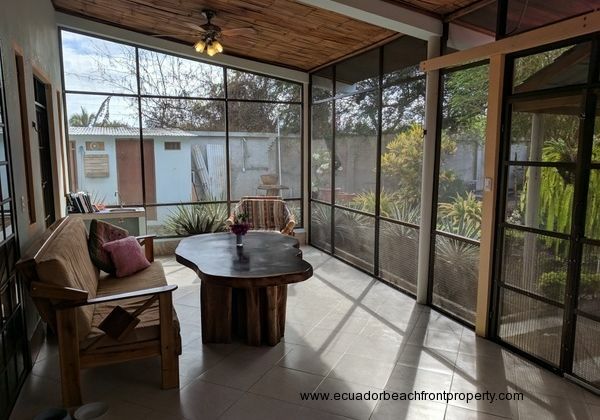 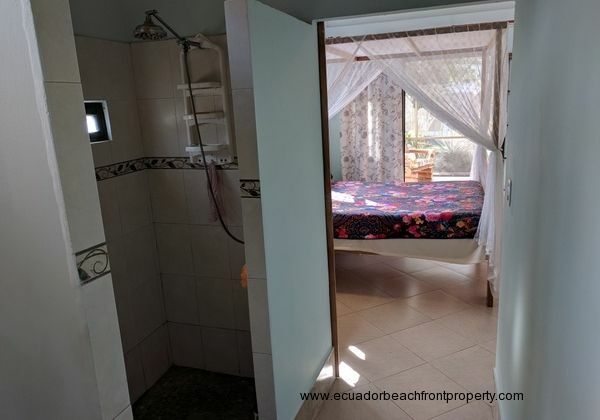 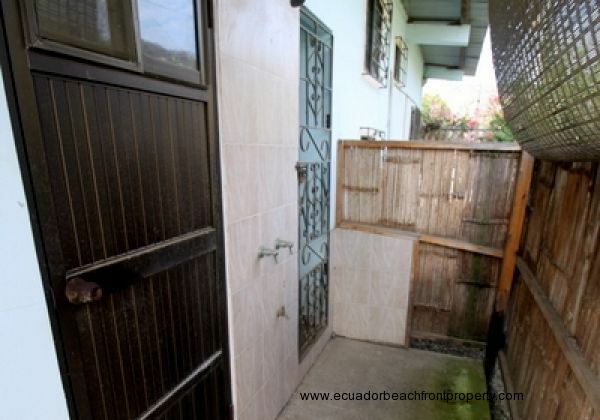 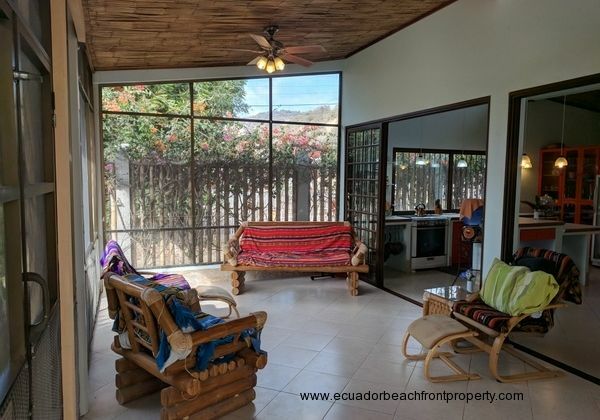 The home is as turn-key as it gets with all the extras already in place for you to make your move to Coastal Ecuador. 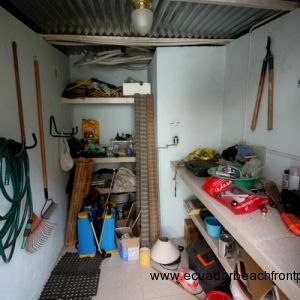 Please take a look at all of the images in the slideshow at the top of the page. 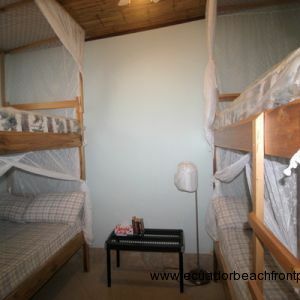 There are many photos so please be patient with loading times depending on your internet speed. Please contact us to schedule a showing or to answer any questions you might have about the property or purchase process. 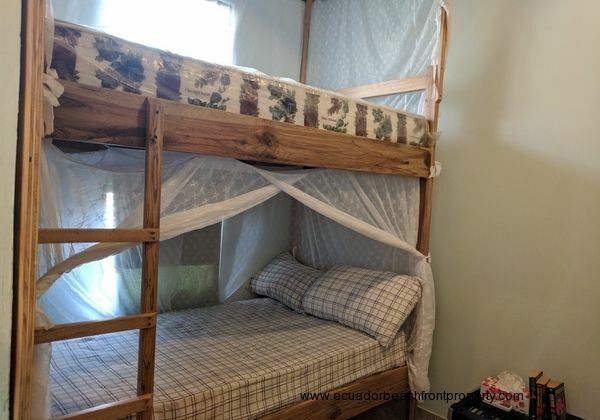 The contact form can be found further down below on this page.